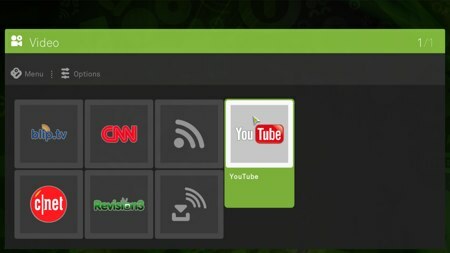 Boxee is the latest piece of software to enter the home theater PC space. It’s recently become available as a public alpha. The first build is only for OSX 10.5, but Ubuntu is coming. Built on the XBMC code base-they even hosted the XBMC developer con last weekend-it has the same goal of letting you navigate and watch/listen to all of your media from your using just a remote. There’s more than just that though. 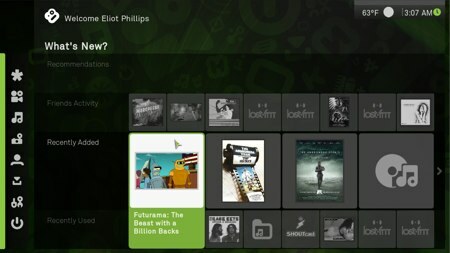 What Boxee adds is a social layer. In the application, it shows your friends’ viewing activities. You can add account info for various video services to get to your saved playlists and subscriptions. You can download podcasts and send your listening habits to Last.FM. Your online profile can be hooked to Twitter, FriendFeed, and tumblr, which can publish your recommendations, what you’re watching, what you’re listening to, and what you’re rating. It’s only alpha so you can expect some quirkiness, and no user guide makes it an adventure. We love the look of the interface. Unfortunately all the dynamic resizing, animated, sliding, floating info boxes make it behave like the zooming user interface‘s retarded cousin. What about the OSXBMC port we covered last month? The developers have decided to fork the code and develop it independently from the Linux port. It will still be nearly in sync with the Linux port, but they’ll have the freedom to removes things that are broken or unnecessary. In any case, it’s great to have two fine media center replacements for Apple’s Front Row. Does it use a 555 timer, or will it let my friends know how much reality tv I watch some other way? Is there anything like Invitations so i can get access to the alpha?? You didn’t click on the link, did you?